Even with director J.J. Abrams’ penchant for secrecy, it’s inevitable that a production as high-profile as Star Wars: Episode VII is going to have some leaks. And it has, ranging from pictures of sets and aliens to the ever-revolving door of story rumors. 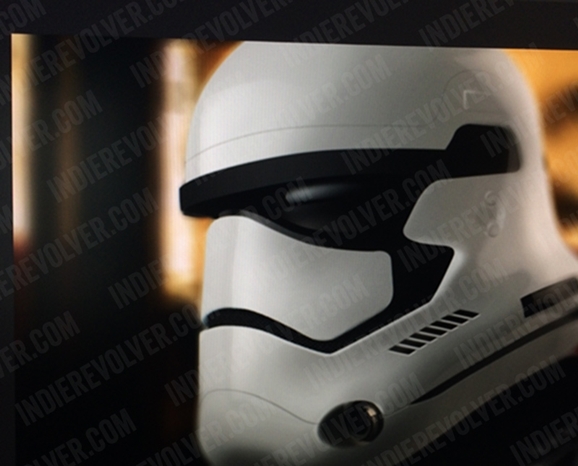 The latest comes in the form of pictures purported to be of Episode VII’s redesigned Stormtroopers. And while the unidentified source for the pics does leave us a bit dubious, there are other details that suggest this might — might — be the real deal. The pic up top is the first of two shots posted today by the site Indie Revolver. 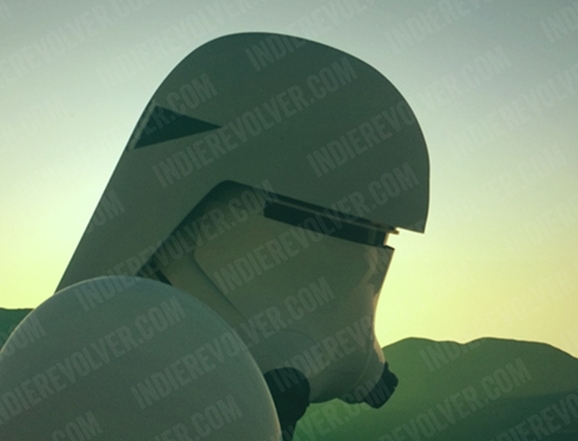 Indie Revolver doesn’t say who their source for the images is, instead just claiming that they have “very reliable information that the images below represent how some of the Imperial Forces will appear in JJ Abrams’ Star Wars film.” That’s the sort of thing that would normally have us reaching for our Salt Lick of Skepticism, but in this case the look of the alleged stormtrooper helmet does seem to line up pretty closely with the following drawing, which was posted by artist Tom Hodges on Instagram earlier this week. 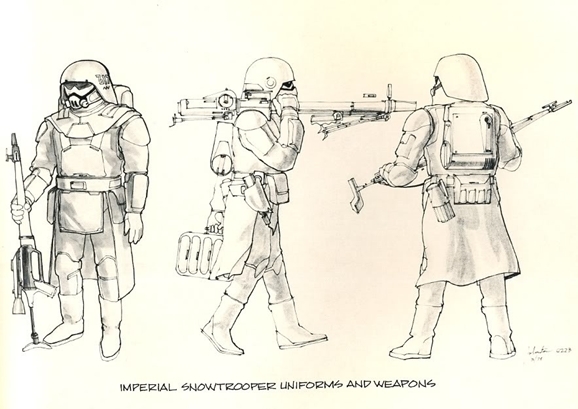 In addition to the standard-issue stormtrooper helmet, Indie Revolver also shared this second image, which they speculate is an updated version of the “snowtroopers” seen on Hoth in The Empire Strikes Back. 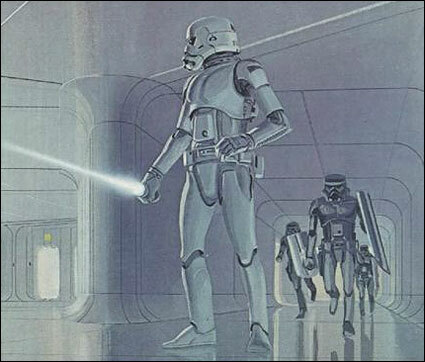 The “snowtrooper” helmet also fits with the description provided in a Making Star Wars story from earlier this summer, and both images are evocative of existing trooper designs by Ralph McQuarrie and Joe Johnston, as seen below. 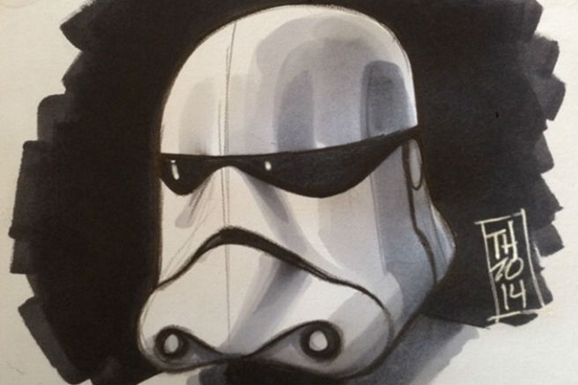 If the pics are legit, the stormtrooper design is a nice evolution of what we saw in the Original Trilogy, and the Clone Troopers that preceded them. Hopefully we’ll see something official from the Star Wars camp in the months to come. Episode VII is currently slated for release on December 18, 2015. So….are they redesigning them so that they can actually HIT something when they fire their blasters? Don’t be silly. They still couldn’t hit anything unless they have bigger guns.